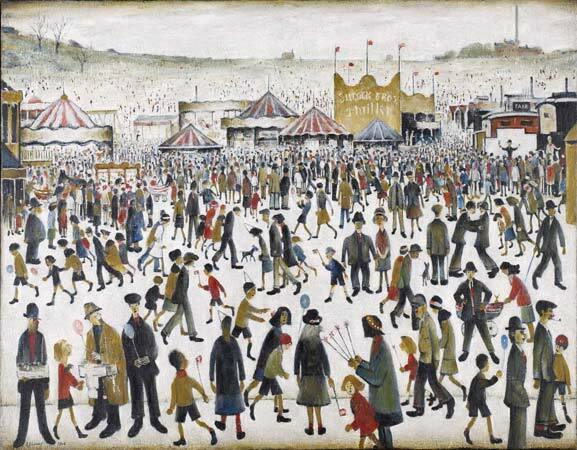 I came across this post below from back in 2012 about my first encounter with the artist LS Lowry. Since then I’ve looked at a lot more of his work and read more on his life, all of which has made me realize how much I was missing before then. He was an interesting figure, providing me with one of my favorite responses when once asked what he was doing when he wasn’t painting: Thinking about painting. I know all too well what he was saying. Anyway, I thought I’d repost this if only to once again play the song about the distinct figures that populate his world, Matchstick Men. Take a look and give a listen. I feel sort of embarrassed to admit this but I had never heard of L.S. 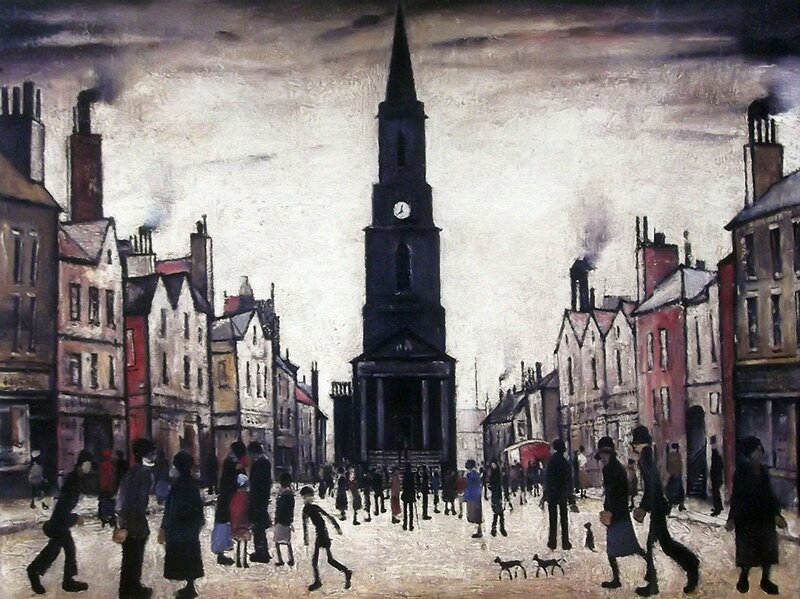 Lowry until I stumbled across him the other day. I am most likely not alone in this but would have thought he would have crossed my radar screen at some point, especially given his prominence in the British art world and in British culture. Not that I know a lot about British art or pop culture. But this is a beloved painter there who has sold many works in the multi-million dollar range, one selling for a record $9+ million last last year . This is not an anonymous artist. I am still discovering more about this painter with a most individual style but here is a very short summation. He was born in the north of England in 1887 and died in 1976, having spent most of his life as a rent collector for a property company. Although he is often referred to as a self-taught artist, through much of his working life he studied art in the evenings at various schools. 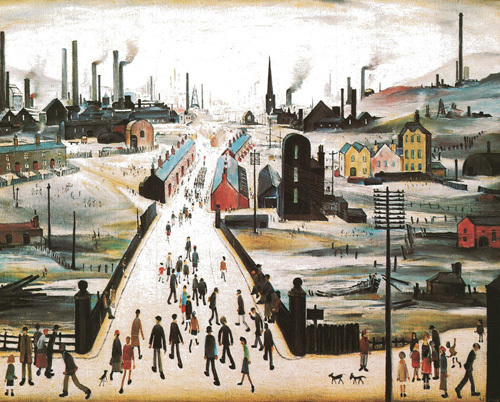 He used this study and the environment around him to find the distinctive style that marked his work, one that is populated with matchstick figures walking through urban scenes, often heavily filled with images of the English industrial landscape. His work has permeated British popular culture as well. His matchstick figures were the basis for a 1967 rock song, Pictures of Matchstick Men, from Status Quo that was later became a hit here in the States when covered by Camper Van Beethoven in the 80’s. 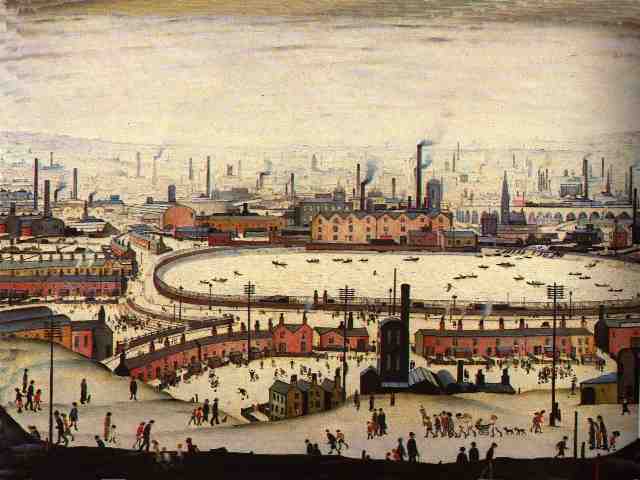 And more recently, the British group Oasis had a video, The Masterplan, featuring the band members as matchstick men walking through animated scenes from Lowry’s paintings. 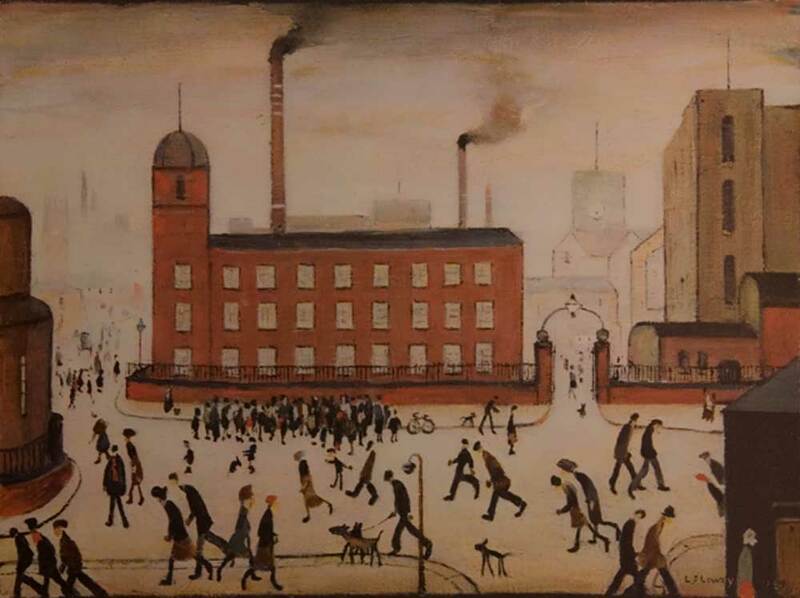 In fact, Noel Gallagher, one of the leaders of Oasis, has joined a growing chorus of fervent Lowry fans in Britain who have been calling for greater displays and recognition of the late painter’s work there. 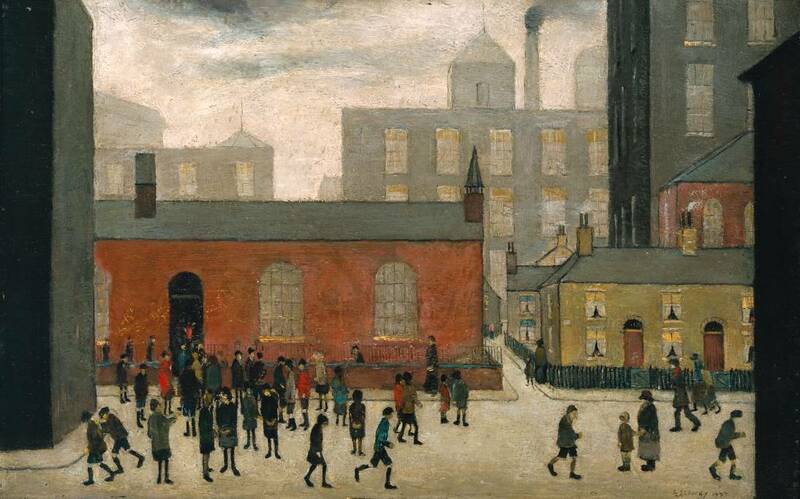 As a result, the Tate is mounting a major retrospective of Lowry’s work for 2013. There’s a lot for me to like about Lowry which makes just finding him now more puzzling. But I have found him and will continue to learn more. For now, here is the both the Status Quo song and the Oasis video. It’s not just the men and women. I got such a kick out of those “matchstick dogs” that are roaming around. Lowry would have loved the black-necked stilt I posted this morning. Like flamingos, they have legs so long they almost look out of proportion to their bodies; they’d fit right into one of his paintings. I think you are right! Great photo, by the way. Did you hear the other song about him from the 70s? Search “Matchstalk Men” on youtube. Thanks for that, Amanda. I was not aware of this.